Richards Bay is SA's premier bulk port and the most modern. Built in 1976 for the export of coal, it has since expanded into other bulk and breakbulk cargoes. In 2008 the port handled 82.7 million tonnes of cargo. A far cry from the unimpressed view expressed by Commissioner Henry Cloete in 1843, when he surveyed the Mhlatuze estuary and declared it to have little or no potential as a future harbour. Situated at Longitude 32º 02' E and Latitude 28º 48' S, Richards Bay, South Africa's most northernmost and easterly port, is 87 nautical miles (160 km) northeast of Durban and 252 n.miles (465 km) southwest of Maputo. A dedicated railway line connects the port with Mpumalanga Province and Gauteng and was designed specifically to handle the majority of South Afroca's coal exports. Other rail links connect Richards Bay with Durban in the south and Swaziland and Mpumalanga to the north. There is an adequate road system to Gauteng, Swaziland, Mozambique and Mpumalanga, and an excellent road south to Durban. The port occupies 2,157 ha of land area and 1,495 ha of water area at present, but has the potential of expanding when required, making Richards Bay potentially one of the largest ports worldwide. Richards Bay serves the coalfields of KwaZulu Natal and Mpumalanga Province as well as timber and granite exporters from as far away as the East Cape and Northern Cape Provinces. In 2006 the port is handling an increasing variety of bulk and neo bulk cargo in addition to breakbulk. Much of the general cargo has migrated away from Durban in recent years. Exports remain the main activity of the port. There are currently 21 berths in service including those at the privately operated Richards Bay Coal Terminal but excluding the dredger and tug berths. An additional coal berth is currently under construction. The port has extensive rail and conveyor belt systems servicing the berths from nearby factories and plants. The port of Richards Bay is open 24 hours a day 365 days a year. 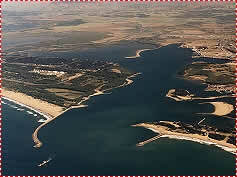 The entrance channel is dredged to a permissible draught of 17.5 metres with a -19,5m depth in the entrance channel. Berthing varies between 8m (small craft berth) and 19m (coal berths). Pilotage is compulsory for all vessels from approximately 3 n.miles southeast of the south breakwater, with pilot transfer performed by pilot boat. Navigation is subject to VTS (vessel tracking service system) operated from Port Control offices, which oversees all shipping movements inside port limits. Tug assistance is compulsory. Draught within the port varies according to location. The largest ship handled in the port so far was the 372,201DWT Brazilian Pride, which had a length of 363.7m, a beam of 63.4m and a maximum draught of 21.8m. The largest shipment of coal was lifted onto the 206,258DWT bulk carrier Ocean Vanguard. Richards Bay operates a fleet of five tugs owned and operated by the National Ports Authority (NPA), all Voith Schneider-propelled craft. They are maintained to SAMSA class 8 standard and are equipped for fire fighting and salvage. The port also employs a twin-screw diesel work boat/tug of the Tern class named Swift Tern, which has a bollard pull of 19 tons, which also provides pilotage transfers when necessary. This vessel entered service at Richards Bay in September 1998. Pilot service was provided by an Agusta A109 K2 'HPS' twin-engine 8-seat helicopter operated by Balmoral Maintenance Services. A standby diesel powered pilot boat is available. Dredging is performed by the NPA on an ongoing basis inside the port and immediately outside the entrance using a trail suction hopper dredger named Ingwenya (formerly HR Moffatt). The port operates a single screw launch named Piet-my-Vrou. Additional international dredging firms are borught in to assist as necessary. The NSRI has a base at Richards Bay, which includes a deep-sea rescue craft. During the 2008/09 financial year ended 31 March 2009 Richards Bay handled a total of 1,750 ships with a gross tonnage of 59,576,095. During the same year the port handled 82,734,127 tonnes of cargo, of which 78,709,588t was bulk cargo and 3,912,178t breakbulk. Exports amounted to 76,409,865 tonnes and imports were 6,211,792t. Richards Bay consists of a Dry Bulk Terminal, a Multi Purpose Terminal and the privately operated Coal Terminal. Other private operators within the port include several wood chip export terminals and a bulk liquid terminal. During its 2008/09 financial year the Richards Bay Coal Terminal (RBCT) handled 61.79 million tonnes of export coal, a sharp decrease on the previous year (66.16Mt in 2007). The terminal is undergoing a refurbishment to increase its capacity to 92 million tonnes annually. Ships are handled at five berths (301-305) each 350m in length with a -19m water depth alongside and a permissible draught of 17.5m. The adjacent 209 chemical berth is 300m long and has a depth alongside of -14m with a permissible draught of 12.5m. 200-wagon trains deliver coal to RBCT on a non-stop daily basis, each payload averaging 16,800 tonnes. Transnet Freight Rail delivered 62,66mt of coal to the terminal during the period (2008). A maximum of 6 million tonnes of coal can be stockpiled at the terminal. There are 80km of rail track within the RBCT complex. The terminal has handled well in excess of 1 billion tonnes of coal for export since opening. A fully equipped diving service is available for ship inspection. Ship repair is undertaken at the quayside (usually the small craft berth), as the port currently has no ship repair facilities, although a large facility is being planned. A dry or floating dock is under consideration but this matter has dragged on for several years without conclusion. The port with its immediate region has become a popular call for international cruise ships because of the close proximity to game parks and the St Lucia World Heritage Site. Cruise ships make use of either the small craft berth or one of the normal cargo handling berths depending on the size of the ship. There is a modern marina adjacent to the tug and dredging berths at the small craft basin. Water sports and recreational facilities are available in the harbour at reserved places. Bunkering is provided by bunker barge or from the chemical and coal berths - berths 209, 301 and 302. The outer anchorage is situated approximately 3 - 5 nautical miles south-east of the port entrance. An inner anchorage is available for emergency use only.